You are here: Home / Blog / WaterSticks / Does a Shower Water Filter Really Soften Water? Does a shower water “filter” really soften water? Why not? There are dozens of companies who sell shower water “filters” (also known as “shower head filters”) and although some of them advertise that their shower filter will give you “soft water” or “soft water effects” or “softer skin and hair”, NONE of them are capable of actually “softening” water. Softening water involves the removal of hard water minerals such as calcium, magnesium and iron which a filter is not capable of doing. To soften water, you need to use a SOFTENER! You can prove this by using a hard water test kit as it will show no change in hardness when using a filter. And the companies who falsely advertise these products as being able to soften water have nothing to loose. Since the majority of them are outside the USA, hardly anyone would be willing to return their product for a refund since they’d be responsible for return shipping charges which would in most cases cost more than the amount paid for the product. And some of these companies even charge a re-stocking fee. The 2 ways to obtain soft water in a shower are by using a whole house softener or a shower softener (such as the “ShowerStick”). Both use resin beads to soften water via a process called “ion exchange” and the resin is regenerated with salt water. To soften water in a shower you need a large volume of resin and you need to be able to regenerate the resin. Filters don’t contain softening resin and they aren’t regenerated (they or their cartridges are usually replaced every 6-12 months). Q: What does a shower head water filter do and why am I not getting the results I want? 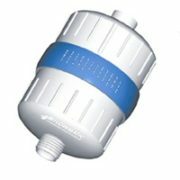 A: Shower “filters” mainly remove chlorine. Although filters are beneficial for your skin, hair and health, the results that many people are looking for cannot be obtained with a filter alone. Without using a “softener” to remove the hard water minerals, these minerals will continue to build up on your skin, hair and scalp and cause all kinds of negative effects such as dry itchy skin and dry brittle frizzy hair (see list of negative effects below). Soft water is the key to obtaining the best results. Two options for achieving soft water are listed below. Q: How can I obtain soft water in my shower? A: The ONLY WAY to soften water in a shower is by using resin beads through a process called “Ion Exchange”. This involves using a MUCH larger volume of resin than what would fit inside a shower filter. And the resin needs to be regenerated with salt water. Even if there was a shower filter on the market that contained resin beads, it would be such a tiny amount that you’d most likely only get a couple minutes of soft water from it. And without being able to regenerate the resin, the filter would never again produce soft water. 1) Installing a whole house water softening system. This can be very costly and not an option for everyone (especially renters). 2) Installing the portable ShowerStick shower water softener made by WaterSticks. This is a great solution for renters or for those who want to avoid the high cost of a whole house water softener. There are benefits to using a filter but many who first try using a shower filter alone don’t end up happy with the results it gives. To get the best results, you need to soften the water. The ShowerStick is a true water “softener” since it removes hard water minerals which are known to cause dryness since they build up on your skin, hair and scalp. So unlike a filter alone, water from the ShowerStick will test as soft when using a hard water test kit. 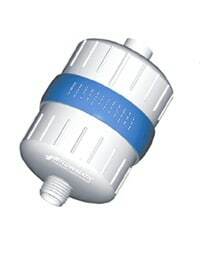 If you want to include a shower filter in-line with the ShowerStick to remove chlorine and other contaminants, we do offer a KDF filter as an optional accessory. The water would first flow through the KDF filter then through to the resin inside the ShowerStick body to get softened. Q: What are some of the negative effects of hard water? Because of the volume of calls and emails we’ve received over the years from people with similar concerns and questions, we decided to create this Blog. Our hope is that the information we’ve provided will help clear up any confusion regarding the differences between filtered water and softened water, what soft water is, how it can be obtained and what the negative effects of hard water are. WaterSticks also makes portable softeners for the water supply in RVs and boats and portable softener deionizers for spot free washing of cars, RVs, boats, solar panels, windows, etc. Best Soft Water Filter How Soft Water Can Benefit You!